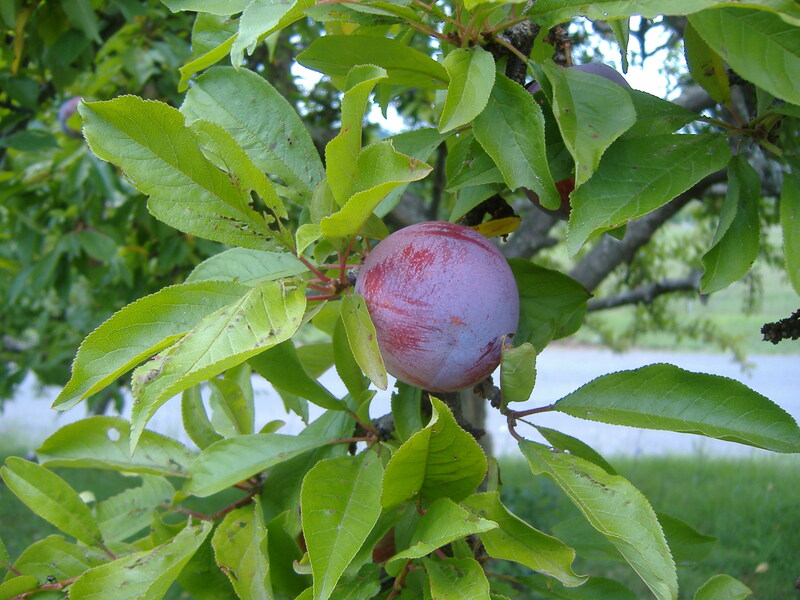 At end-July, local plums are top-of-mind. They’re things of beauty. Imperfectly round. Smooth-skinned. Typically purple, with subtle or dramatic variations, ranging from yellow and red-tinged, to gently lavender and midnight-blue. From its dark skin to succulent flesh, plums are a rich source of antioxidants and nutrients—vitamin C, vitamin A, potassium and B-complex vitamins, including niacin, B6 and pantothenic acid. I often forget that fresh plums are chockfull of dietary fiber; at peak ripeness, luscious plums are so radically different from dried, shriveled prunes. 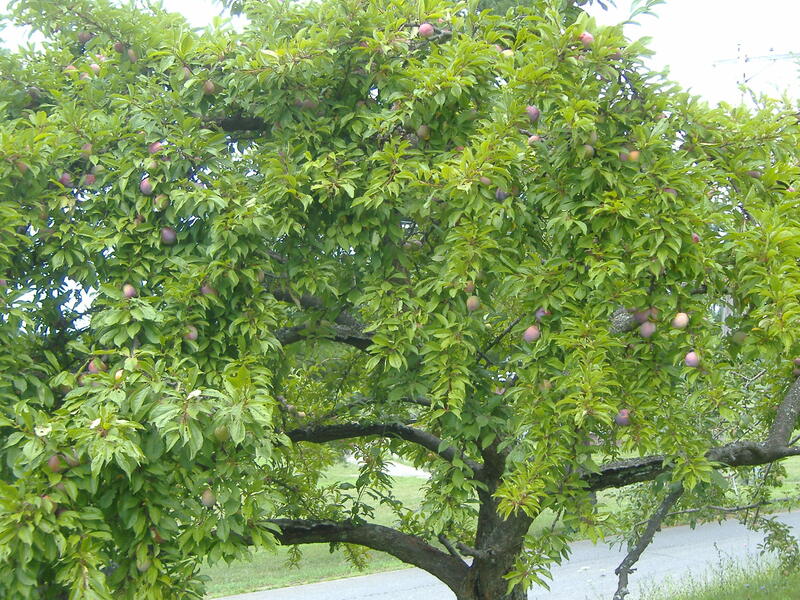 When we bought our farmhouse in 2001, we inherited fruit trees—plum, apples and pear—with the property. And over the last 9 years, we have (literally) harvested the fruit of someone else’s initial labor. Right now, our lone plum tree is engorged with fruit. Unfortunately, for us, it’s a race against time, the weather, the beetles and the birds, to get our fair share of these red-hued lovelies (we strongly suspect that we’re enjoying the Japanese variety— a.k.a. “Santa Rosa”—of plums). Once these babies hit the ground, you can kiss them good-bye. Just two weekends ago, Chris set a single plum, still greenish and hard, on our window sill. Last weekend, a row of plums jockeyed for space on our counter. This weekend, our kitchen overflowed with our plums. We filled “gift bags” for friends and family. When it rains, it pours. Determined to take advantage of this short-lived bounty, I devoted my Sunday morning to making a plum tart. My recipe was one that I had adapted from a two-year-old summer issue of O Magazine. This time, I tweaked the recipe again, cutting the sugar. Chris and I both have bittersweet buds and an aversion to tooth-achingly sweet treats. Plus, plums in peak season are already naturally sweet. Cook’s note: How little sugar could I get away with?? I reduced the sugar by nearly half, from ½-plus cup to ¼ cup sugar total (for both crust and fruit) for a slightly tart-sweet result. 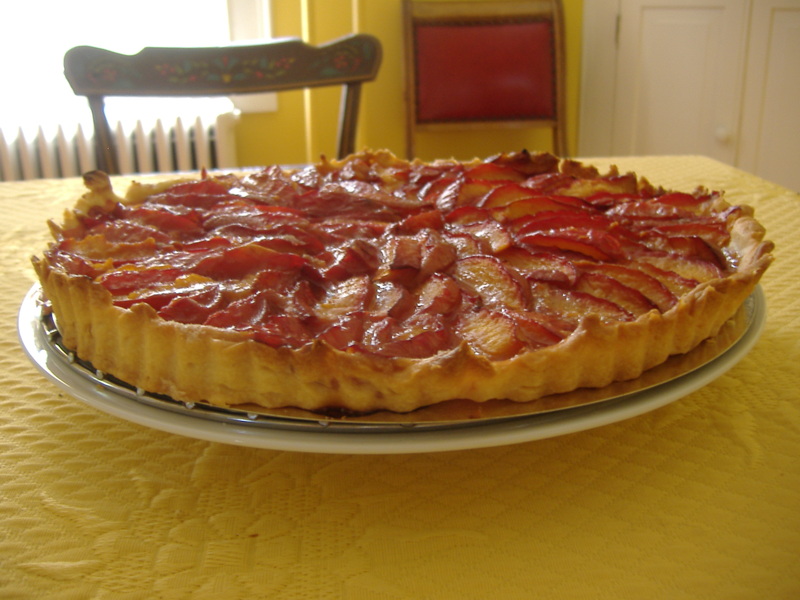 This entry was posted in At Our Farmhouse, Home Baking, Local Food and tagged plum tart, Plums. Bookmark the permalink. I can’t wait to taste some of these plums in season! You’re so fortunate to have those fruit trees on your property.